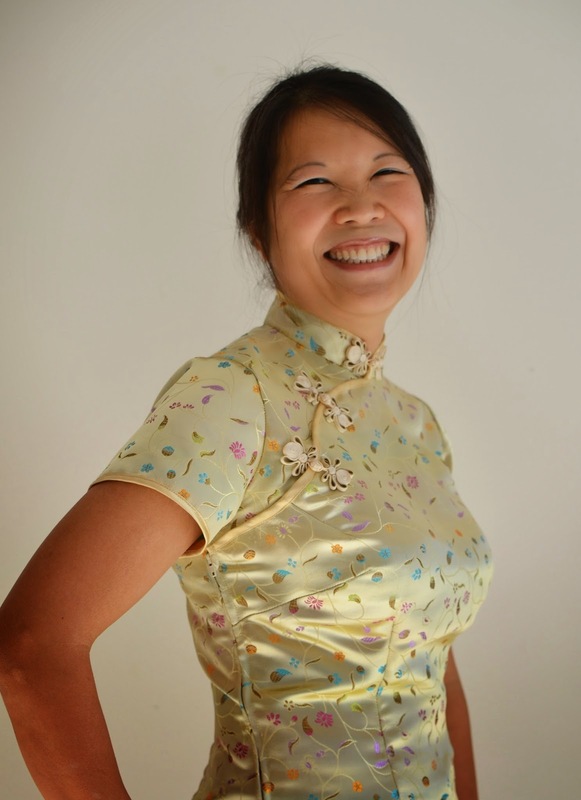 Today, we are deconstructing the qipao blouse. 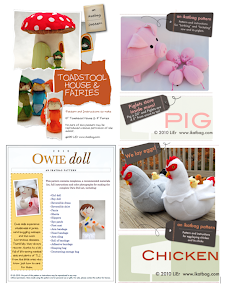 I'm aiming to be as detailed as I can but I will not include tutorial-style step-by-step instructions to draft it. 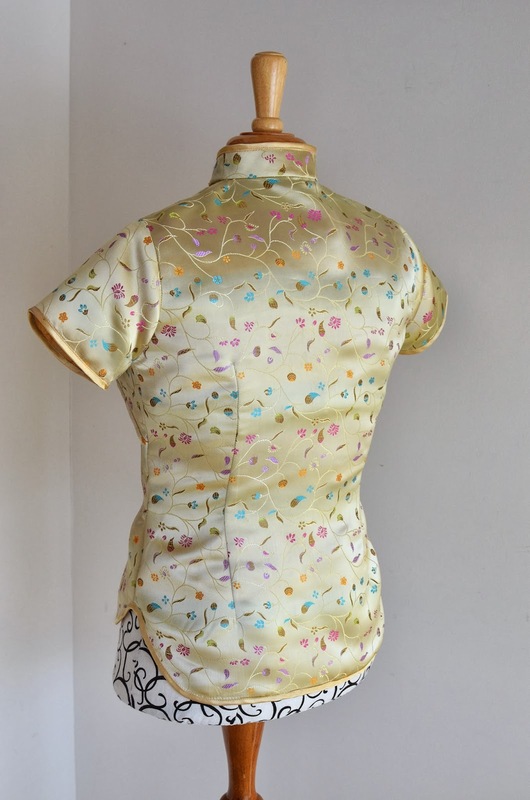 This is because creating a qipao pattern for an individual person is as much continually adjusting for precise fit as it is drawing all the lines and darts for the initial draft. We're going to start, as we always do, with a basic foundation block aka sloper. I used my french dart block. 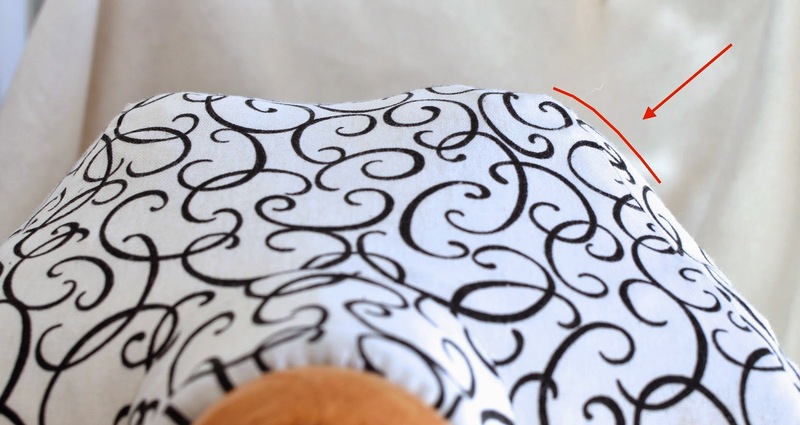 If you don't have one, you can start with a woven pattern that fits very well. So no T-shirts or tunics or leotards or anything like that; something like a fitted button-down shirt (with darts) might be more suitable. 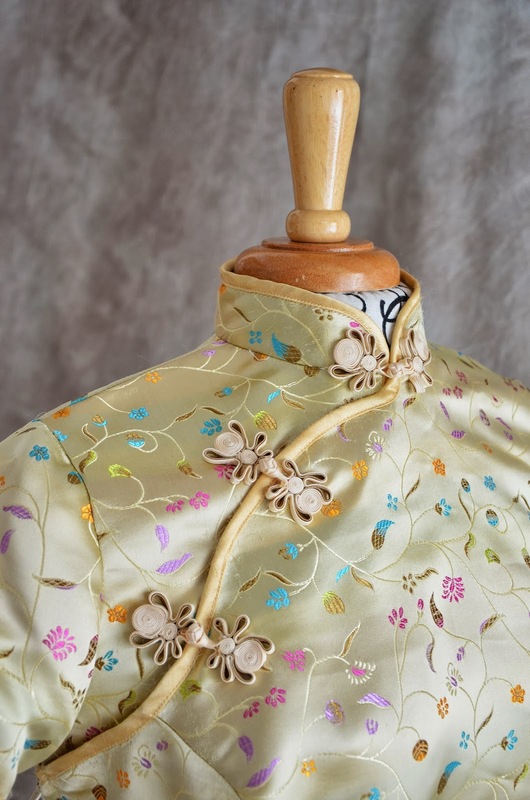 You will find yourself taking in ease in many areas, some in unusual places, even if you start with a sloper, because a qipao is a very fitted garment, with practically no ease. 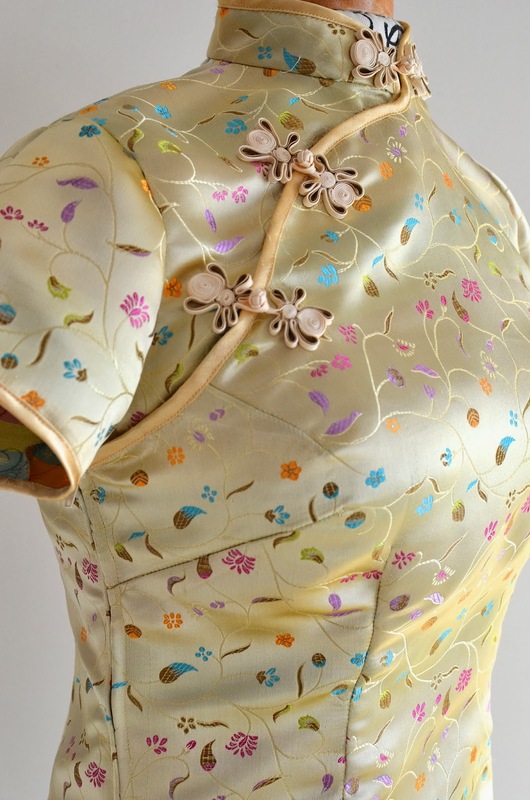 At the same time, it should still be a garment that allows a fair bit of movement, which is a challenging drafting requirement not only because of the snug fit but also because the material does not have much give (you cannot make a qipao out of knit fabric so unfortunately, we cannot cheat that way). There will be compensations, of course, and we will discuss them later. Let's do the back first. We began with the basic/foundation block and used it as is from the waist up. From the waist down, we chopped it off about abdomen- level, flared it very slightly from the waist to the hem (see red arrows), and curved the hem up at the side seams. We also kept the back darts. Nothing dramatic there. It is completely symmetrical and very straightforward draft. No fit issues, either - the back sits on the body as the foundation block/sloper would, even in its muslin stage. Now let's work on the front. 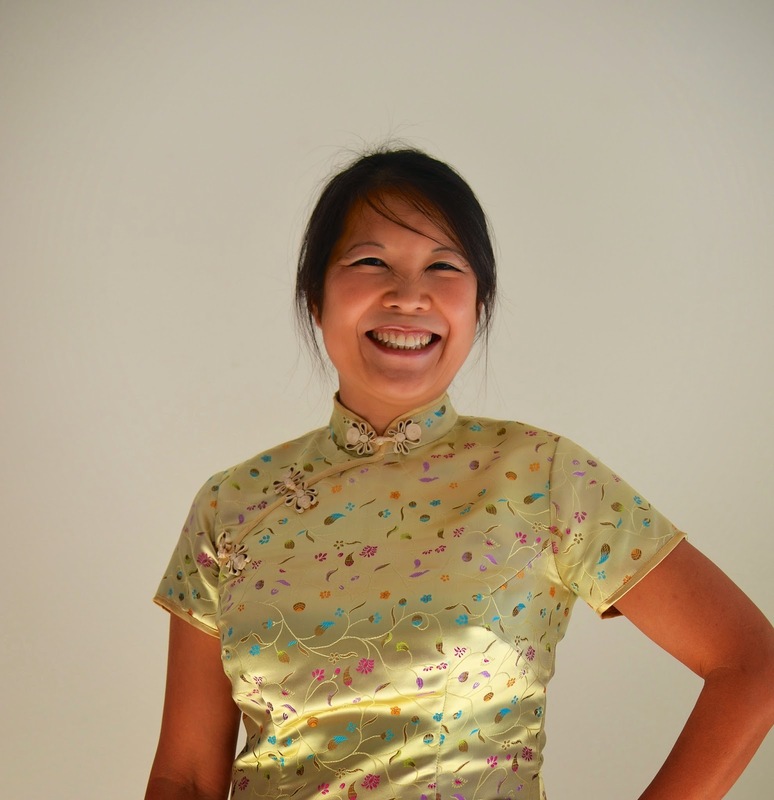 From a drafting point of view, the qipao is an interesting garment for many reasons. One of these reasons is its asymmetry. By that, I don't mean that its hem slants lower on one side of the body, or that one sleeve is different than the other. Instead, I mean that the front pieces are different on the right and left side in the draft. You might be familiar with cross-wrap dresses, whose mirror-image front pieces cross over the body and cannot be laid out along the center front fold. 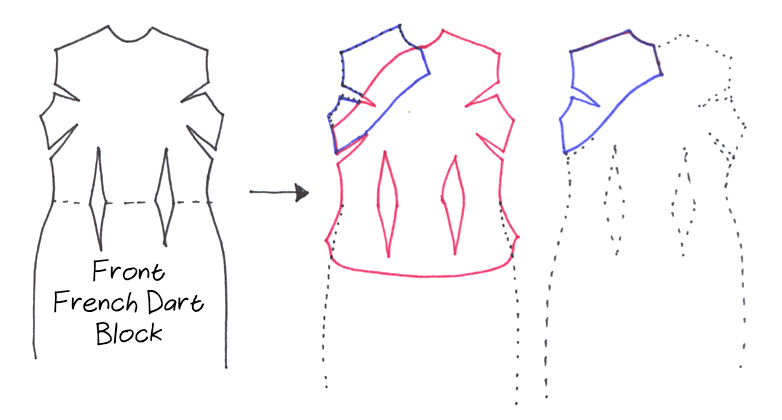 See sketch below of a typical cross-wrap bodice (ignore the numbers; they are for another tutorial). 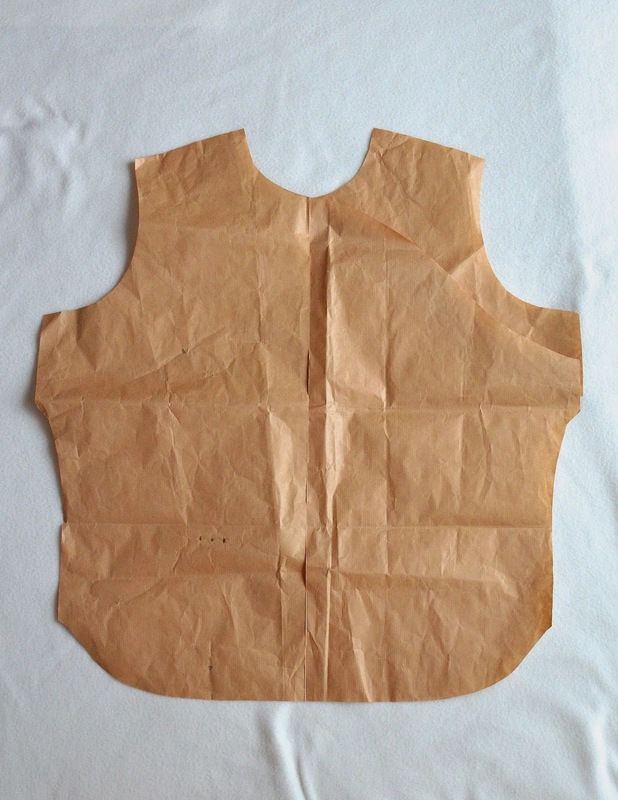 However, they are still mirror-image symmetrical and the left and right pieces can be cut out with the typical double-layer layout of fabric. In addition, their symmetry implies that they have identical darts, and any fit issues can be easily corrected by replicating the adjustments on both pieces equally. with an overlapping portion for a button panel. 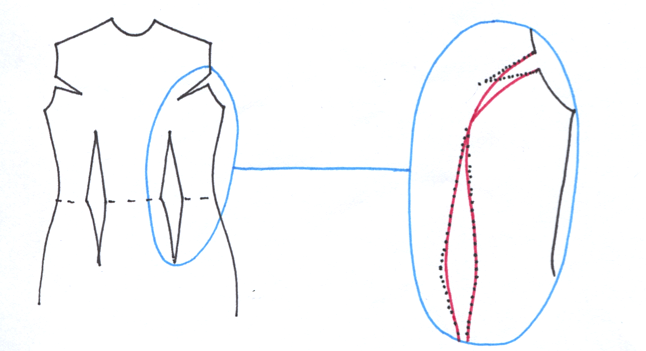 This asymmetry extends to the darts: while symmetrically drawn in the original draft, they are not present symmetrically in both pieces of the front bodice. In addition, the location of the separation of the two pieces results in at least one of the darts being only partly sewn shut (and continuing on the other piece). The overall effect = it is trickier to adjust for fit because one cannot simply "take in or move the darts by the same amount on the left and right"; there is no longer a straightforward "left-and-right", or a convenient place to move them to. Since we're on the topic of darts, let me digress a bit and talk about curved darts. Everyone knows straight darts, right? They are the triangular/diamond-shaped pinches of fabric you sew shut to take in ease in localized hollow spots. Curved darts allow you to shape those hollow spots more precisely. They are especially useful around rounded portions of the body e.g. the bust region. so it curves around the side of your bust more gently and does not peak in a nippley-looking dimple. 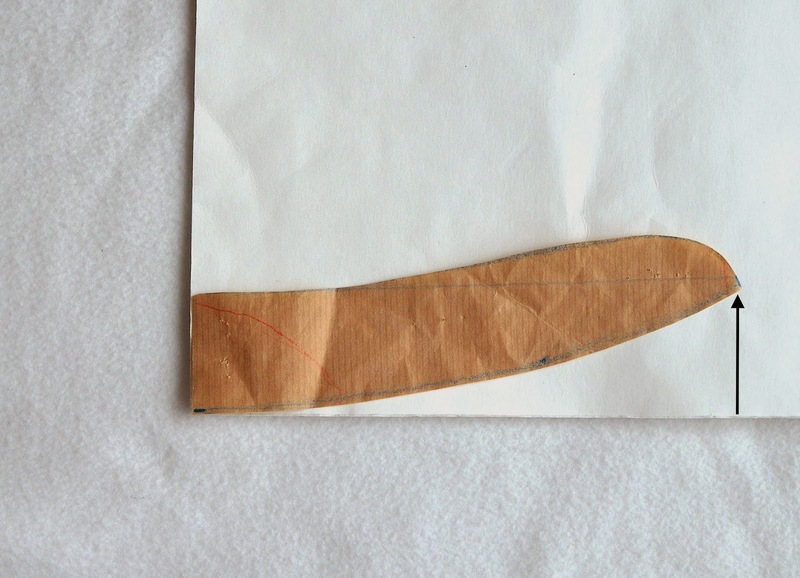 When sewn shut, the dart still looks like a straight line, but the fabric has been pinched in a curved way behind it. 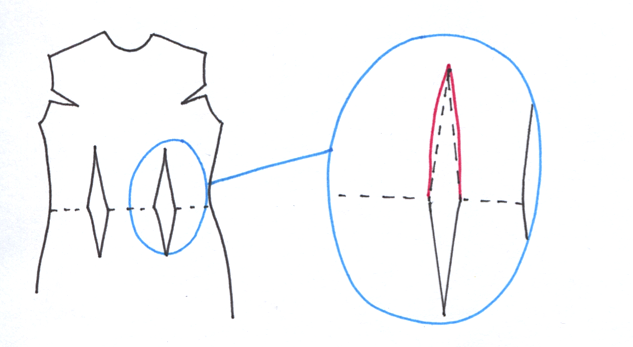 We use convex darts to pinch more fabric in a particularly hollow area, like the region immediately under the bust. 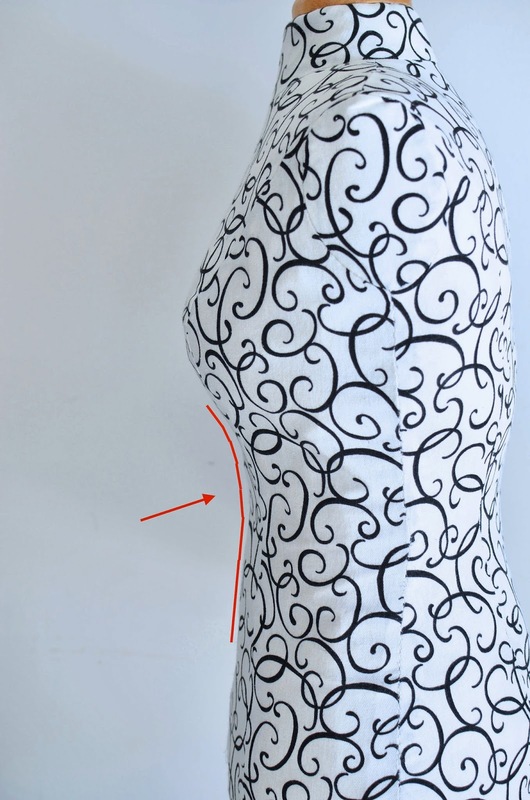 See this hollow underbust area on Fleur? in garments that call for it. Like the concave dart, the fabric is pinched in a curved way but the dart itself looks like a straight line when it is sewn closed. 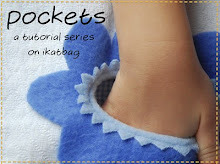 Okay, this is probably old stuff to you, because even if you haven't sewn one yet, you've read about it here on ikatbag about a million times. I love princess seams so much!!! Read about them here and here. End of Dart Detour. Summary: shape your darts to shape your contours better. Simple principle, right? Let's talk about the collar next. That mandarin collar is just a stand collar. There is nothing special about it. If you've ever sewn a shirt collar, you'll know there are two parts to it: one is the stand, which is the erect ring of stiff fabric that holds the actual pointy collar up. 1 they have to fit around your neckline. 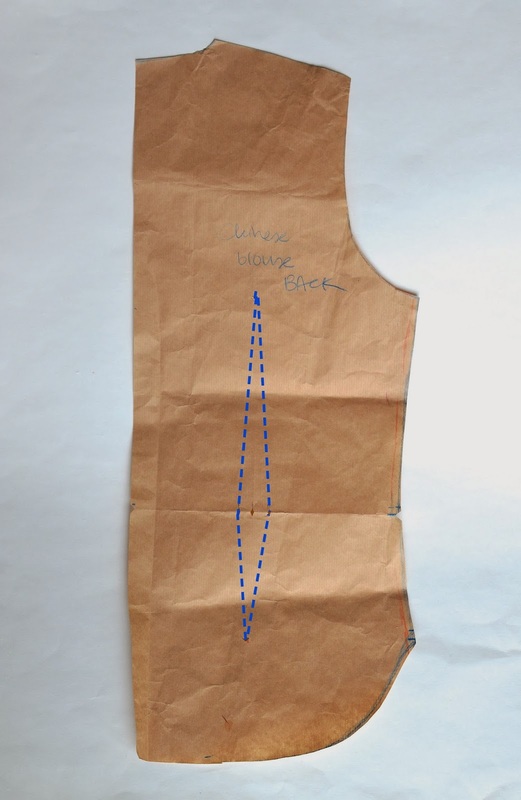 So measure half your neckline from center back to center front, and make sure the bottom edge of your stand collar (drafted in half) matches that exactly. The more closely you want them to slant inwards to hug your neck, the more curved they should be. See my collar draft below - the bottom edge rises away from the horizontal reference line quite a bit (shown by black arrow). The interfacing: a light fusible (no SA) ironed directly onto a piece of cotton (with SA) to create a stiff, thin and SEPARATE sew-in layer. 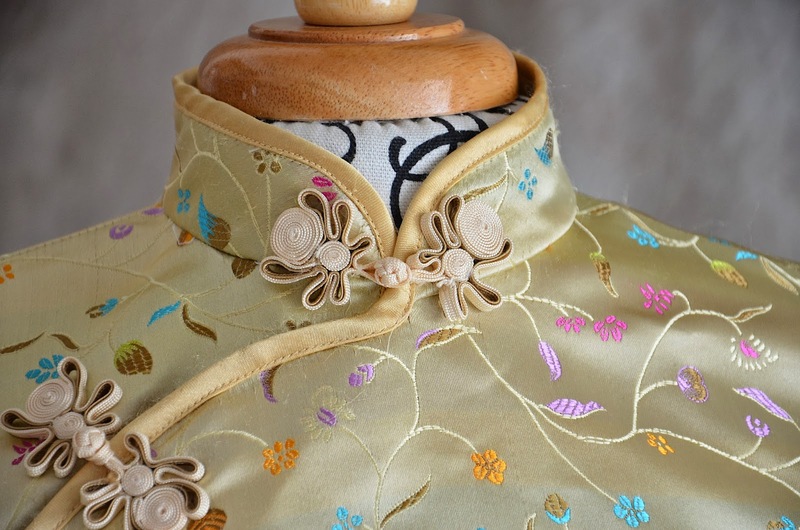 Do not iron the fusible interfacing directly onto either of the lining or outer fabric layers, or you will get rolls, puckering, or uncomfortable stiffness as the collar curls around your neck. Finishing up now: there is a separating zipper along the side seam. Now that the bodice is finished, all that are left are the sleeves. 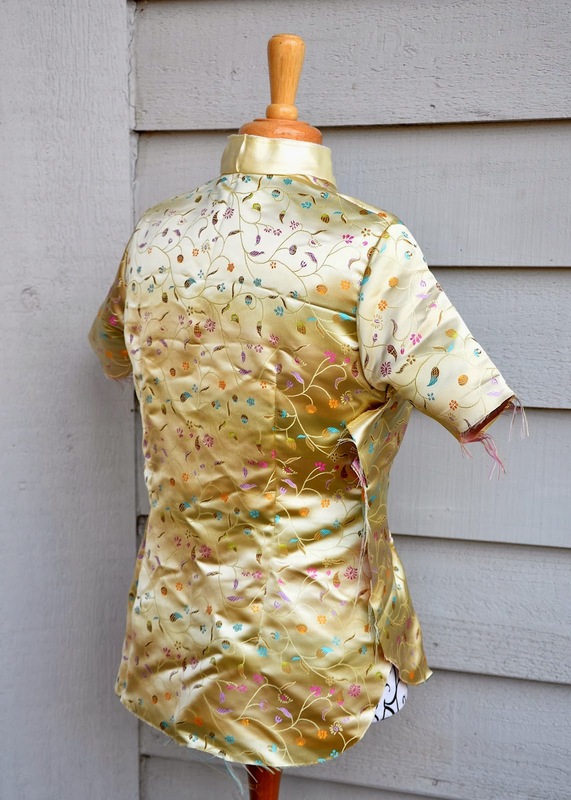 Traditionally, qipaos and qipao blouses have cap sleeves. These can be integrated into the draft by extending the shoulders out, or set into the armscyes. Cap sleeves are not for everyone because they cut off at what is (for most people) not the most flattering part of one's upper arm. I've heard it said that unless you are a teenager, or have exceptionally toned or skinny arms, avoid cap sleeves and opt for a slightly lower sleeve hem. 1 Always obtain a superior armscye before attempting to set in a sleeve. Otherwise, your sleeve, no matter how beautifully drafted, will be compromised. Check out the muslin armscye in the photos above - it was too large. 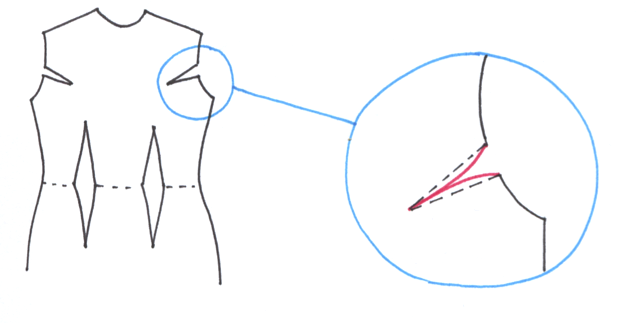 An armscye that is too large restricts movement (counter-intuitive, I know) because it pulls on the sleeve when one moves one's arm. A smaller armscye pulls less on the sleeve and allows more freedom of movement. 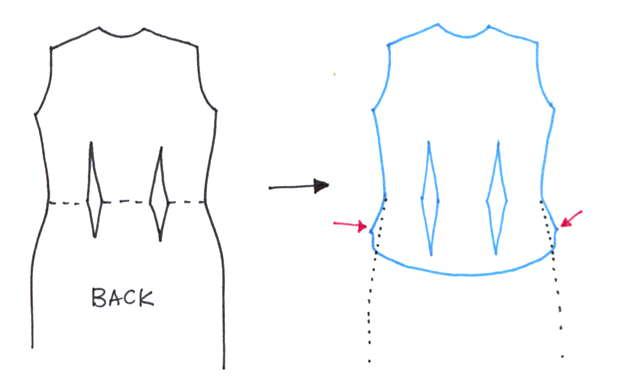 2 The shallower the angle of set of a sleeve, the more movement it allows, especially with fabric that has very little give. Translation: a more horizontally-lying sleeve (final version) is more comfortable than a more vertically-lying sleeve (muslin version). Before we end, let me encourage you not to be afraid that unstretchy fabric + a snug fit = uncomfortable or impossible to move in. All you need to do is fit your armscye and bust well and you'll be surprised at how much movement you can manage. We're finally at the end now! Thank goodness that's gone now. See you back for the Frog Button Tutorial! (Or the Sleeves Tutorial. Whichever I'm in the mood to tackle first). Very clear "deconstruction"! How thoughtful and patient you have been with this for the benefit of us who are none of the above. 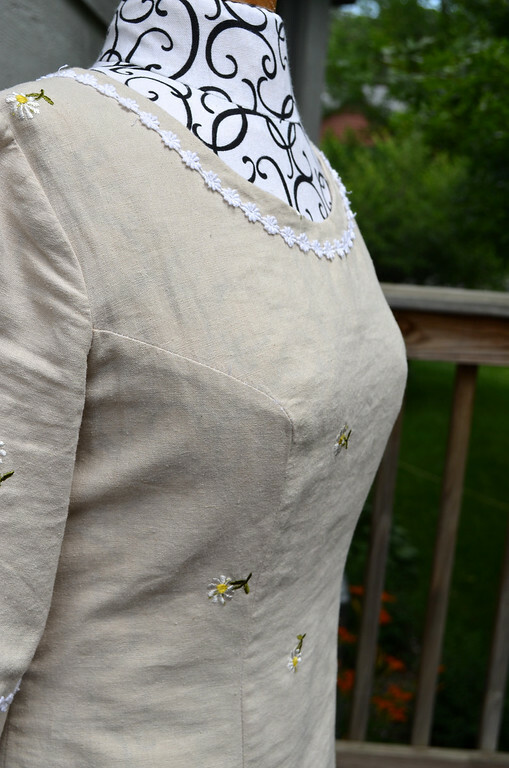 I can also see the hours and hours of labor of love from the muslin to finished blouse. It is truly a lovely piece of garment. You must enjoy this blouse by wearing it to every, I mean every important event! 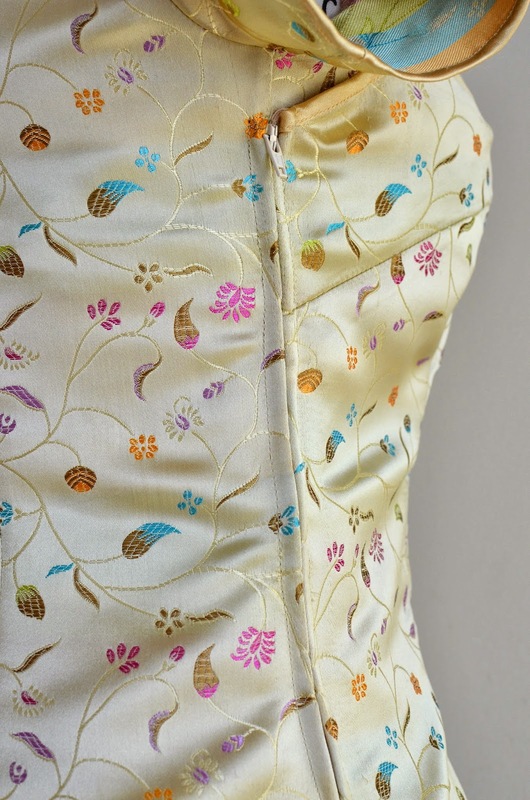 One small observation: you placed the entire top left dart on the front bodice, none on the inner piece, not as the block/paper pattern green line suggested. I understand from the text, that this is enirely the result of fitting. Now, let's get to the frogs. FROG, FROG, FROG!! Thank you! "Well-endowed folks, take note: your garments should always have an armscye dart, because it shapes your armsyce around your assets more fully than a french dart or a sole waist dart." 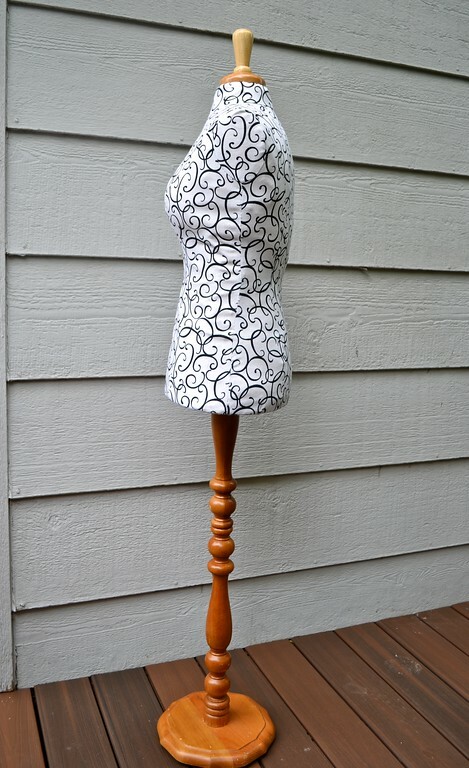 Oh, so that's what was wrong in the dress I made with the French darts that has a baffling fit issue above the bust. Thank you! I had no idea what the problem was or how to fix it. I learn so much from reading these posts. I've also been reading through the Dorothy Moore pattern drafting book recently since my husband found it at a local auction and brought it home for me, and it is amazing. It makes so much sense when it's put that way. A while I was trying to draft an A-line skirt and kept having problems and after reading through there I know exactly what to do about it now & really want to work on it this weekend. Lier Koh: Hope that I get your name right, your Qipao Deconstructed is very very helpful. I have searched the Web for a good illustration on sewing Qipao, only got two good book downloaded from websites from China. They did not address the fitting as well as you did, drawings on these books became confusing. 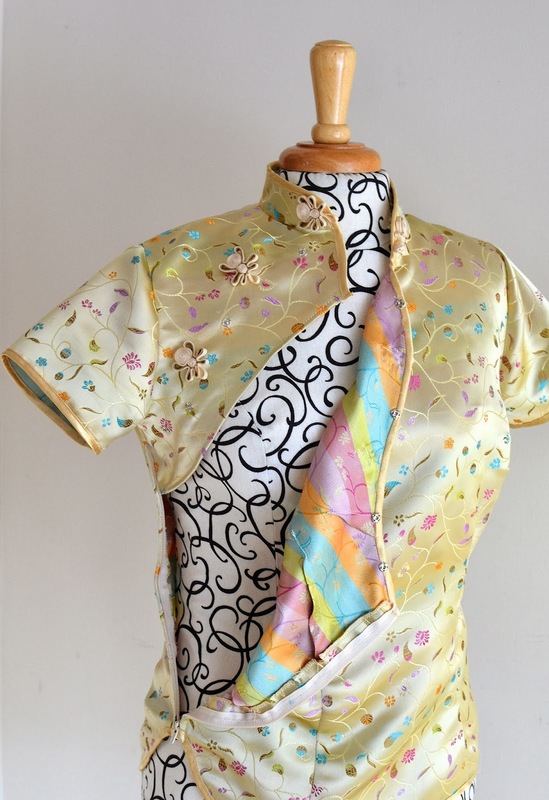 I used a Chinese Qipao pattern from Japanese designer, bought in a bookstore. Very appreciated your time and efforts. Just wonder if translation in Chinese is allowable, or if you charge fees for the copy right. I am sure if your article is translated correctly, it will benefit many many readers in Asia. Anonymous: No, do not translate this (or any) post to your (or another) site. Readers who prefer to read my posts in Chinese can use the auto translate widgets to change the language on ikatbag itself. Can I ask did you keep the dart in the underflap or not? I'm finding it hard to tell. 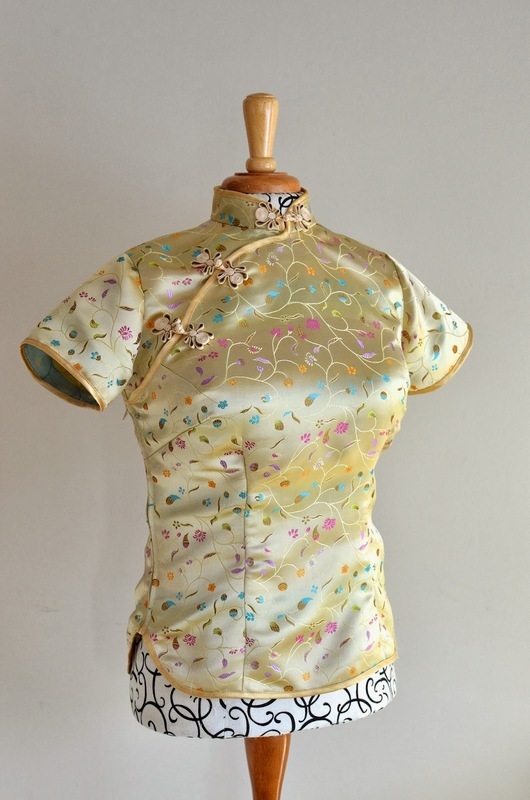 I haven't got a qipao pattern but after seeing one on the sewing bee I really want to make one. 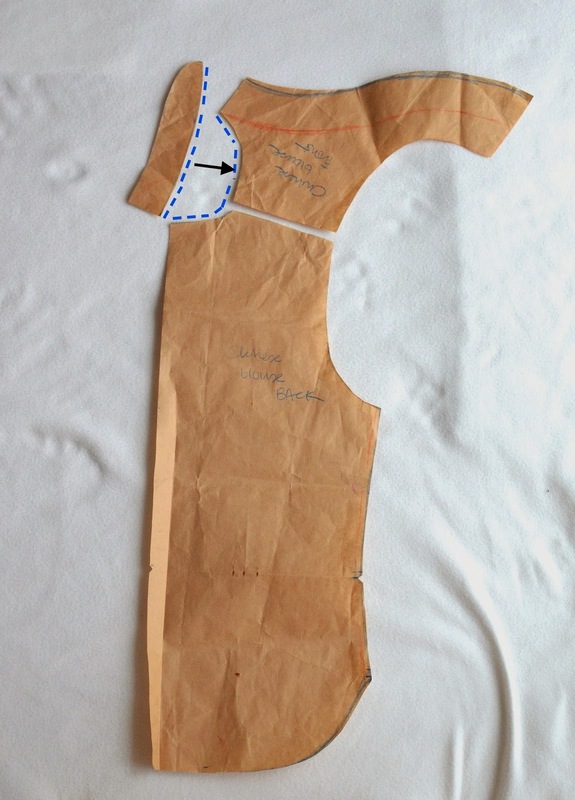 Do you think simplicity 2246 (lisette pattern view C) would work as a sloper to modify? M'lady: No dart in the underflap. 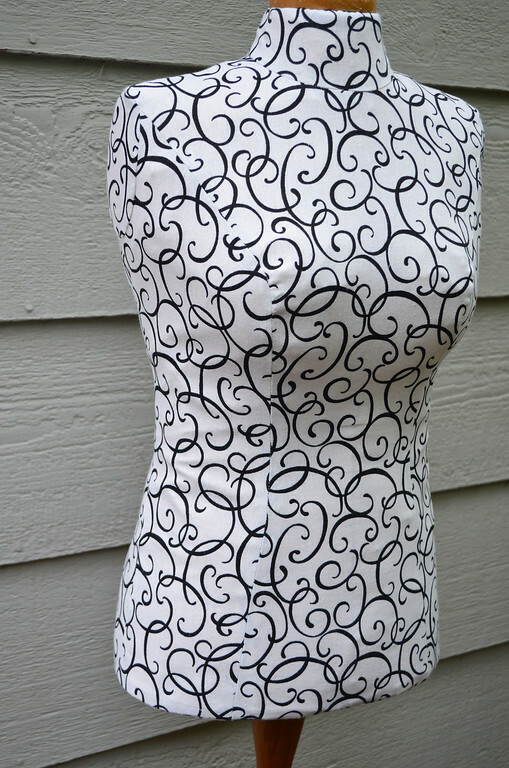 There is an armhole dart in the draft, but I incorporated it somehow into the natural curves of the underflap piece. How, I can't remember, unfortunately. My best guess is that I reshaped the armscye - smaller, rounder. I am afraid I am not familiar with commercial patterns, so I don't know Simplicity 2246. Do you have a photo or a link? Its out of print now but I got it free with a sewing magazine ages ago. 1 The darting on view C is appropriate for a qipao - it's a side/underarm bust dart, which will work for adapting to a qipao in theory. 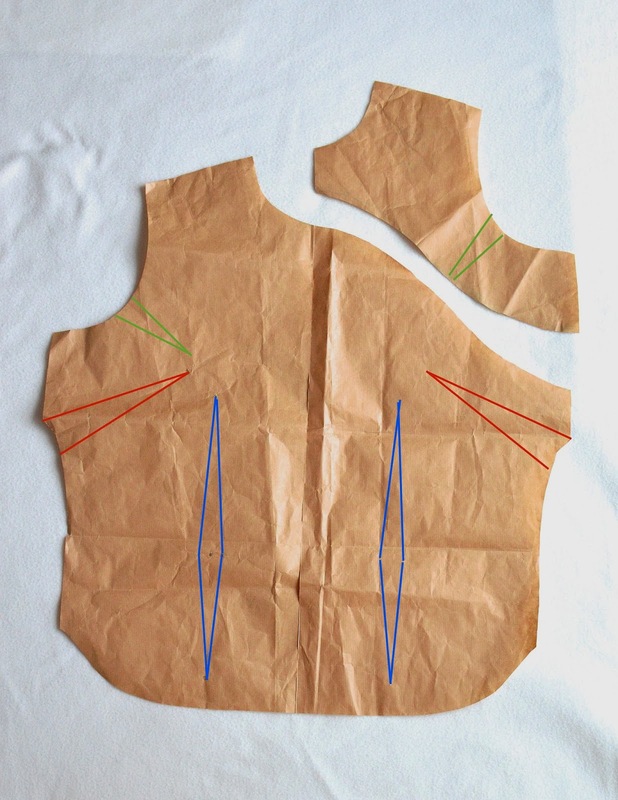 Depending on your particular figure/curves, that single dart may or may not be enough for a fitted qipao. You might have to draft in an armhole dart, and a vertical waist dart as well. 2 The cap sleeve looks somewhat puffed in the sleeve cap (it's hard to tell, so I could be wrong) in View C, but too narrow and pointy in the main view. 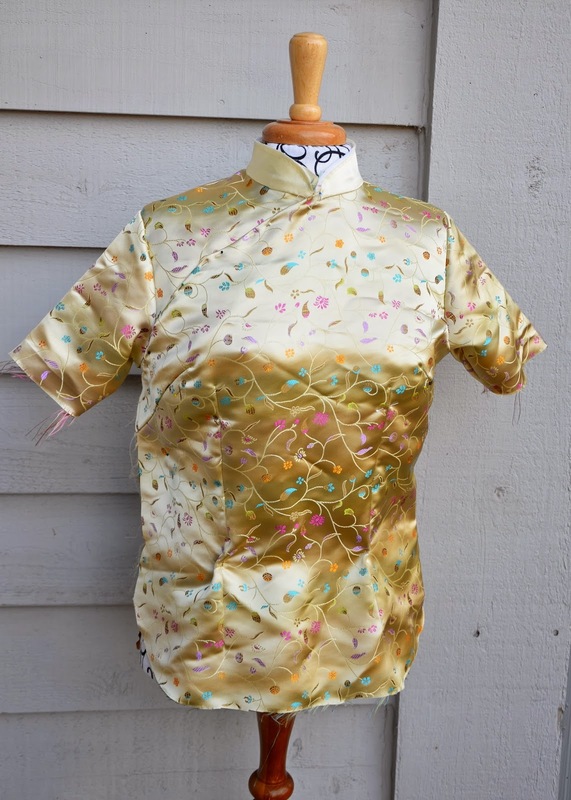 Qipaos do not have puffed cap sleeves. Some even have integrated cap sleeves. But the pattern is a good starting point. 3 There is a lot of ease in this pattern, even in View C. Again, depending on your particular contours, a little more ease than traditional qipaos have may be flattering and more comfortable. As long as there are darts, you can adjust the fit to what you want. You'd have to fix the hemline at just above the hip, too.